GRAFFITI PAINTINGS! Crazed Citizens, Robot Buildings and Metamorphosing Monster drawings from the City of Gear! 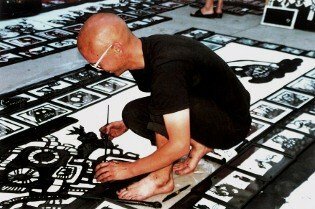 2005 was a big year for my work as a street artist. 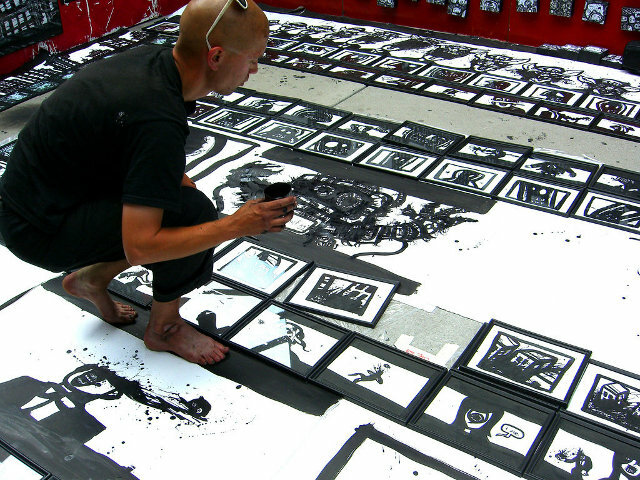 I was working full time on Queen Street West practicing were I rapid drawing performances and developed a whole new approach to making black and white artworks. I was focusing a lot on creating individual caricatures inspired by all the strange people I’d seen and met working in public. 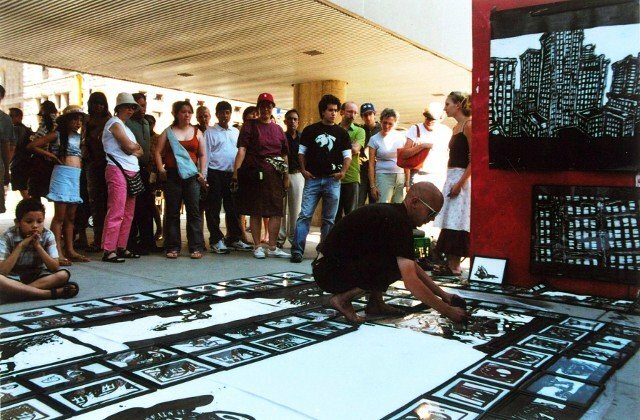 By the middle of the summer I was easily creating 5-10 poster-sized images in a single afternoon and when the Toronto Outdoor Art Exhibition opened I seized the opportunity to put on a huge painting performance which lasted for the entire duration of the event. 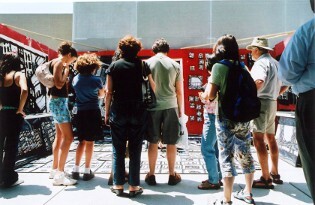 At the 2005 T.O.A.E. 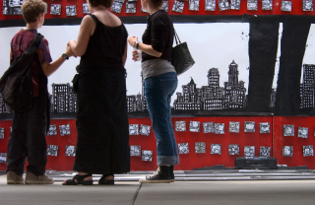 I set up my 10 x 20 foot painted red portable gallery for the fourth consecutive year. 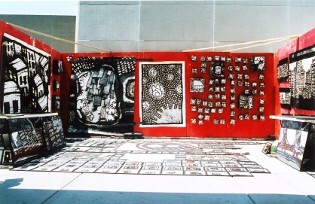 Once again the installation included a huge variety of graffiti paintings ranging from 8x 10 inches to by 10 feet however this exhibition was the first to feature a large scale public painting performance. I covered the ground with a 12 x 10 foot grid of blank paper and proceeded to draw crazy cartoon characters and surreal comic book styled cityscapes. I worked continuously for the entire three day show completing approximately fifty 30 x 40 inch artworks. 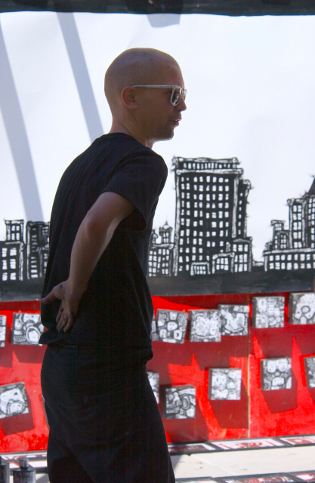 Luckily A portion of the event was captured in a time lapse video by Slavek Smigiel. 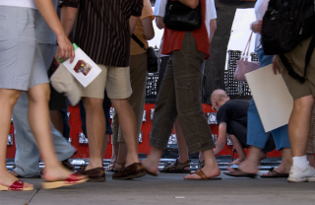 The exhibit was amazingly successful and drew crowds unlike any I’d seen before. 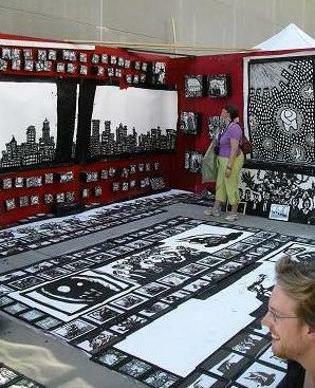 The place was so full of people that I couldn’t even see the artists or the street situated directly across from me. The strange public process and presentation I initiated out on the sidewalk had turned into a full force event. Not only did I paint throughout the whole weekend but I also kept talking as the crowds kept pouring in. I met hundreds of people from all over the world. As with all of my outdoor experiments I was especially excited to engage in thoughtful conversation with people who don’t generally take any interest in art. I sold work to businessmen, families, tourists and even teenagers. I also spent a lot of time sitting and drawing with children which is always quite interesting as you never know what they might do or say. At the end of the event I came to a weird and somewhat contradictory conclusion regarding the creation of artworks in public; while the collectors and gallery intelligentsia seemed to supply the bulk of the monetary finances that support such endeavors, it was the interactions with children, teenagers and unsuspecting pedestrians which provided the most stimulating and educational of experiences. As a result I started making a conscious effort to produce drawings that could be both intellectually provocative and accessible to audience of all ages.